For most people, a Spring Break Island get-away would mean going someplace warm and sunny, like Hawaii or Mexico, and laying on a beach relaxing. For BeerSeek­ers, it means a BC Ferry rather than a plane, lots of liquid sunshine, and the chance to visit some new breweries. 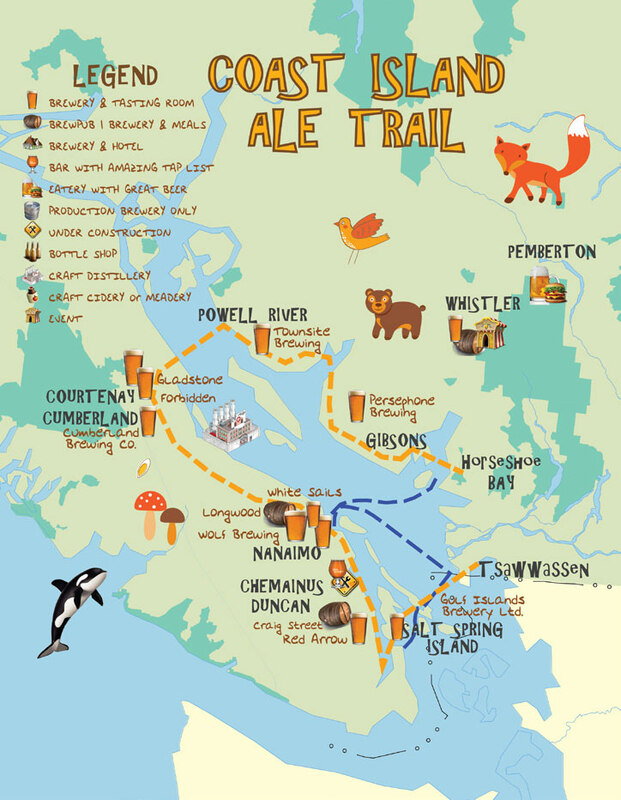 This year, we decided to forgo our usu­al Portland trip and instead do a Coast/Island Ale Trail loop, starting in the Cowichan Valley, then up Island to Comox Val­ley, across to Powell River and down the Sunshine Coast. We visited a dozen breweries in seven days, sampled more than 60 different beers, and experienced some of our beautiful province. On a rainy Saturday, we boarded our first of several ferries and headed to Salt Spring, which neither of us had visited before. 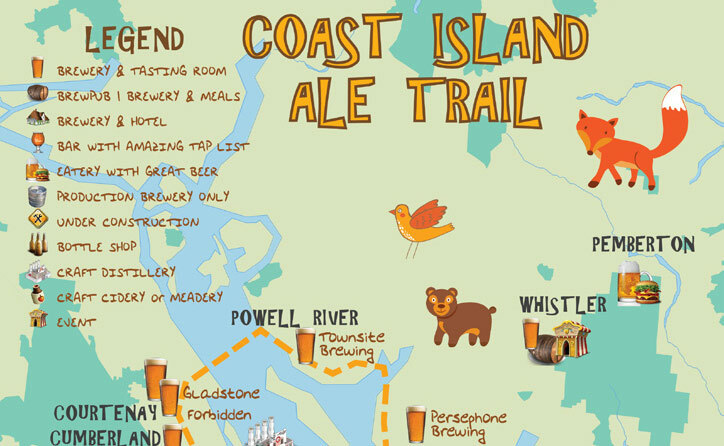 Gulf Island Brewery is about a 20 minute scenic drive from the ferry terminal. Its good signage is easy enough to find, but it’s tucked well back from the main road. The setting does not at all resemble your typical brewery (we’ve heard it described as very “Saltspring-like” by more than one person). A rather steep set of stairs—easier to navigate on the way up than on the way down—took us to a cozy tasting room. While they are not ac­tually licensed to sell beer to drink on the premises, they will pour you samples while you decide what you would like to take home. We spent about an hour there, bought a few bottles to take with us, then headed back up the road to catch the (free) ferry to Duncan, our stop for the next couple of nights. Our accommodations in Duncan were provided by long-time friend Brenda Burch, who was kind enough to act as hostess, driver and tour guide during our 2-day stay. First up was the Craig Street Brewpub for dinner., an impressive multi-floor es­tablishment. The top level, in use by a private party, contained the only TVs in the place, which meant that one of us had to miss watching his beloved Whitecaps in action. Although we found the beer list rather limited, the pub had an extensive and reasonably-priced food menu. Also, they run a free shuttle service on Friday and Saturday nights; no taxi required. The next day was a rainy one in the Cowichan Valley; nev­ertheless, the Beerseekers were being chauffeured around Shawnigan Lake by our engaging host, taking the opportu­nity to learn about the Cowichan from an expert. For years, Brenda lived in Cobble Hill, a community right in the heart of the Valley. She’s watched as the semi-rural region has ma­tured and found its identity as a producer of artisanal crafts, food and beverages. The area is a farmer’s-market paradise; there are plenty of blueberry and lavender farms, and foods ranging from jams to cheeses to salsa and more. Brenda mentions that the local crop of wineries, with names like Blue Grouse Estate and Cherry Point, started to show up 15-20 years ago. Even as recently as 10-12 years ago, she says, the wine was undrinkable (Brenda has high standards), but now it’s ready for prime time. There’s no doubt that our ballooning craft beer scene has had some similar kinks to work out. Our drive ended with a stop at Red Arrow Brewing, which shares some common ownership with Craig Street. The tasting room is large and airy and the “arrow” motif is prevalent. They are licensed to serve patrons up to 12 oz per order, which they pour as three 4-oz samples. With seven beers on tap at the time and two of us to share them, that left one beer out! Luckily, we were able to get that last sample. Their signature beer is the slightly hoppy Piggy Pale Ale, named for the local rugby team. Later that evening we celebrated our wedding anniversary (12 years of wedded beer bliss). We spent it at the Sawmill Taphouse and Grill, a 20 minute drive away in Chemainus. This upscale pub has 26 beers on tap, mostly Island local, as well as several wines and craft ciders. We stopped by the site again the next day on our way to Nanaimo, to gaze longingly at the construction going on at Riot Brewing, right next door. As one heads north to Nanaimo, about 15 minutes past La­dysmith, one may be lucky enough to glimpse a sign for the Crow and Gate Traditional Pub. Follow that sign and take the exit! The pub is a bit out of the way, about 8 km off Hwy #1, but it is well worth the detour. This magnificent public house is located on a breathtaking, well-manicured private property which includes a sizeable duck pond (with numerous ducks lounging about at all times). The building itself is a classic replica of a centuries-old British pub with a low, beamed ceiling and lots of “shared” tables with benches. There is no table service, so you have to order at the bar or window. The lunch menu, displayed on a blackboard, has plenty of traditional British fare like beef dip, chicken pie and Ploughman’s lunch. The beer selection is representative of a pub that supports craft beer; there were 5 local craft taps plus the typical Irish/UK lineup (Guinness, Kilkenny, etc.). Mainlanders tend to discount Nanaimo as a harbour city with little to offer to urban sophisticates. We were surprised to find that this leg was the winner for the most fruitful beer tour­ism experience of the tour, based on the fact that there are 3 first-class tasting rooms on offer, all of which have a story to tell. Don’t let the past keep you from discovering what’s going on in Nanaimo BC. The city of Nanaimo gets its name from a variation of the Snuneymuxw (Snuh-NAY-moo), the name of the Coast Salish people who were indigenous to the area. Nanaimo began its modern history as a trading post town for the Hudson’s Bay Company, chiefly as an exporter of coal, which was plentiful in the area. Over the years, it continued as an industry town, changing over to forestry and pulp and paper mills in the last century. B.C.’s sixth-largest city is home to the world-fa­mous Nanaimo bar and bathtub races. Nanaimo has been developing its tourism sector with a revitalized downtown, which includes developing arts, culture, dining and recrea­tional activities. For the beer enthusiast, the emerging craft beer scene makes a visit mandatory. Our stopover in Nanaimo took us to four breweries, beginning with the new kid on the block, White Sails. Located on Comox Road in downtown Nanaimo, this historic restaurant building has been converted into a small brewery with a large, airy tasting room modelled on the likes of Brassneck and 33 Acres. While the space is currently limited, there is room for expan­sion in the basement. Brewer Tyler Papp is originally from Calgary. He came to Nanaimo via Revelstoke, where he lived for a few years. Al­though he is much farther from his family in actual kilometres now, Tyler says a 1 ½ hour plane trip is easier than a 4 hour drive through Rogers Pass. Direct flights from Nanaimo to Calgary through both Westjet and Air Canada certainly help. Tyler, hired by the brewery in late spring 2015, visited the city with his wife one day in June of that year to look for houses. Despite a long day viewing at least 20 potential homes, they found nothing suitable. Disappointed, frustrated, and wor­ried about where they would live, the couple flew back home. Lo and behold, they ended up buying a house online, sight unseen. Now they’re part of the fabric of Nanaimo. White Sails generally has six beers on tap. Three are their core mainstays (which they bottle): Departure Bay Session Ale, Yellow Point Pale Ale, and Mt. Benson IPA. At the time of our visit in March, the seasonals were Gallows Point Choc­olate Porter, Colliery Dam Belgian Black and Buttertubs Tafelbier. While Tyler says his favourite beer is the IPA, most of the beers at White Sails tend to lean towards the malty side. The Departure Bay Session, for example, is deliberately not an ISA. Their Pale Ale is more of an English style. And, by the way, that Chocolate Porter is one of the best we have ever tasted! According to Tyler, the use of both organic cocoa nibs and cocoa extract is what gives the beer its intense chocolate flavour. Next, we took a long taxi ride out to the Longwood Brewpub, a well-established and popular spot. We spent time in both the upstairs restaurant and the downstairs pub, sampling some of the 10 beers they had on tap. The next day we visited the much newer standalone Longwood Brewery and caught up with brewer Harley Smith and taproom manager Morgan Garnett. From them, we got clarification about something that mainlanders tend not to understand about Longwood: the two outlets are fairly separate entities, each with their own dedicated brewing teams and even separate beers. Through this arrangement, the Longwood brand lives on as a classic neighbourhood brewpub while also existing as a full-fledged member of the current craft beer wave with its modern tast­ing lounge and packaging operation. The success of Longwood’s new operation can be judged by its products, and perhaps no better evidence is required than Beer Me BC’s inclusion of their Independent Imperial Pilsner in their list of most influential BC beers of last year. Longwood has taken a calculated gamble in leaving the comfort zone of the ‘first wave’ brewpub and opening a separate opera­tion; it is paying off by establishing a new name for a venera­ble BC beer brand. Which is an ideal segue into a discussion of Wolf Brewing, the reincarnation of the old Fat Cat Brewing. That change is old news, but what’s new is that Wolf is finding its footing with a stellar new brewmaster named Kevin Ward. As related by Warren Boyer in the next article, Kevin is a former chef; at one point he worked under Gordon Ramsay in the UK. Nanaimo has an eye on catching up to the Comox and Cowichan valleys for culinary appreciation, but it wasn’t food experience that got Kevin the job at Wolf. He’s also a crack brewer, having been steeped in the traditional ‘real ale’ approach in the UK. He feels that “beer should taste like beer”, and doesn’t mask it with other flavours. Kevin came to Wolf well after the brand change, and his mandate has been to revamp the brewing program. Case in point: their Golden Ale, to which Kevin has made incremen­tal changes. He’s kept track over time, and notes that he has eventually changed every single ingredient in the beer. Not all at once, but eventually it’s become a new product without alienating the original following. As a Brit, Kevin still naturally carbonates all his beers; he pre­fers to avoid forced carbonation. He uses a Spunding Valve on the side of his holding tank so he can monitor the exact CO2 pressure. Balancing between the old ways and new seems to be a theme in Kevin’s work. In the UK, he used all isinglas finings, but here he uses a vegan-friendly biofine. As we continued our beer odyssey north, we entered the beau­tiful outdoor playground of the Comox Valley. This area boasts a wide variety of outdoor recreational activities like hiking, biking, winter sports (it’s home to Mt. Washington), golfing, boating and fishing. There are forests, trails, beaches, parks, campgrounds and plenty of waterways. For those that are less adventurous, there is plenty of shopping as well as resorts and spas where you can relax and book a massage or pedicure. There is something for everyone and if you prefer a quiet after­noon spent in a tasting room, there is that too. First stop was tiny Cumberland Brewing Company. We were greeted by manager Darren and Brewer Mike. Cumberland Brewing is a must-see stop for any beer traveller. To find out why, turn the pages in this issue of What’s Brewing to read our full article on this special brewery. Just 10 minutes away is the city of Courtney, which boasts 2 breweries: Gladstone Brewing and Forbidden Brewing, about a 15 minute walk from each other. Gladstone’s car-themed brand adorns their warehouse-style building; they’ve part­nered with Guerilla Pizza in the space so you can have your slice and drink beer too. There were 7 beers on tap: 4 main­stays and 3 rotating taps. In the middle of a weekday, the brewery was steadily busy. At the end of the day, when people are on their way home from work or from a day spent outdoors, the brewery can boast a lineup out the door as people wait for their growler fills. Forbidden Brewing, a nanobrewery in the same parking lot as the Best Western hotel where we stayed—is hidden, tucked away on the first floor of the adjoining Westerly Hotel. Brew­master Nicholas Williams is a homebrewer and a Grade One teacher who brews for Forbidden after school and on his days off. Being that Beerseeker Ivana also teaches that grade, we had a great discussion about the joys and tribulations of work­ing with 6-year-olds before finding out more about the beer and brewery. We sampled seven very good beers ranging from a Rye Blonde, to a Chocolate Mild, to an 8.5% Imperial Stout. Forbidden, like Cumberland, is a great example of a brewhouse that leverages ingenuity to overcome budget and technological constraints. Turn to the next article, by Warren Boyer, to find out more about the most unusual set-up we have ever seen in a commercial brewery. We definitely recommend a visit. Find out more about why we loved vising the Comox area in our spotlight on Cumberland Brewing. A peaceful, scenic ferry ride takes you across the water from Comox to Powell River on the upper Sunshine Coast. Like all of this area, Powell River is the ideal outdoor playground. There is plenty of majestic, rugged B.C. beauty to enjoy alongside a plethora of outdoor pursuits, such as hiking and various water sports like kayaking, scuba diving, canoeing and fishing. It also boasts a thriving arts and culture scene as well as an urban centre with shopping, hotels and restaurants. A short 10-minute drive north takes you to the old Townsite, a National Historic Site, and home to what was once one of the biggest pulp and paper mills in the world. It is also home to the new Townsite Brewery, housed in a large, two-level pre-war brick building. Most of their operations are on the ground floor, with an enormous amount of room to ex­pand above (although drilling through walls and floors will be nigh impossible in this seemingly bomb-proof heritage building). As you sit in the tasting room, you have an amaz­ing view of the pulp and paper mill in the foreground with Georgia Straight and Vancouver Island in the background. The locals have embraced Townsite Brewing and craft beer in general. There are a growing number of local restaurants that pour craft beer, and the local chapter of CAMRA (led by Van­couver ex-pat Paddy Treavor) is thriving. As is the custom in places that are proud of their history and culture, the names of their products all have some sort of local connection. We spent a pleasant afternoon sampling their seven beers and discuss­ing life with Manager Chloe Smith; read the feature profile on Chloe in this magazine. If you’re coming to Powell River, we recommend staying at the Old Courthouse Inn, just across the street from the brewery. This boutique hotel was indeed home to the local court and jail in a bygone era. The building is full of historic artifacts, and, if you are lucky, you may be privileged to stay in a room that once housed the jail cell. It was recently purchased by an engaging fellow named J.P. Brosseau, and his partner Kelly Belanger. It combines unique old-world charm with modern comfort and amenities, reminding us of some of the McMe­namins historic hotels in Oregon and Washington. Edie Rae’s Cafe, named for J.P.’s mom, serves a delicious and substantial breakfast every morning that is included with your stay. The final leg of this trip involved a couple of hours of driving, broken up by another ferry to take us to Persephone Brewing in Gibsons. Persephone, named after the famous boat from the classic television series, “The Beachcombers”, sits on an 11-acre farm where they also grow their own hops. The setting is rural; the brewery and tasting room are in a big red barn. There were 9 beers on tap at the time of our visit, all good examples of their styles. The ferry terminal back to Horseshoe Bay is a five minute drive from the brewery, so it’s a good place to while away the time while you wait for the next boat. Conversely, if you are staying longer, the marina, with plenty of shopping, restaurants, and the actual Persephone boat, is a short drive (or a longer walk) away. As we boarded our final ferry (did you keep track? there were five) on this most awesome anniversary beer holiday, we re­flected back on the places we’d visited and the people we met. Incredible scenery, delicious beer, friendly and welcom­ing people, all in our own BC backyard! What more can a Beerseeker ask for? 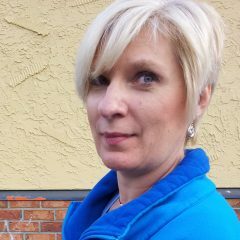 Ivana Smith has been a craft beer fan since the late 1990s, and a CAMRA BC member since 2004. Along with husband Dave, she travels Cascadia as half of the beer duo BeerSeekers and writes about beer travel for What's Brewing.